Hey! 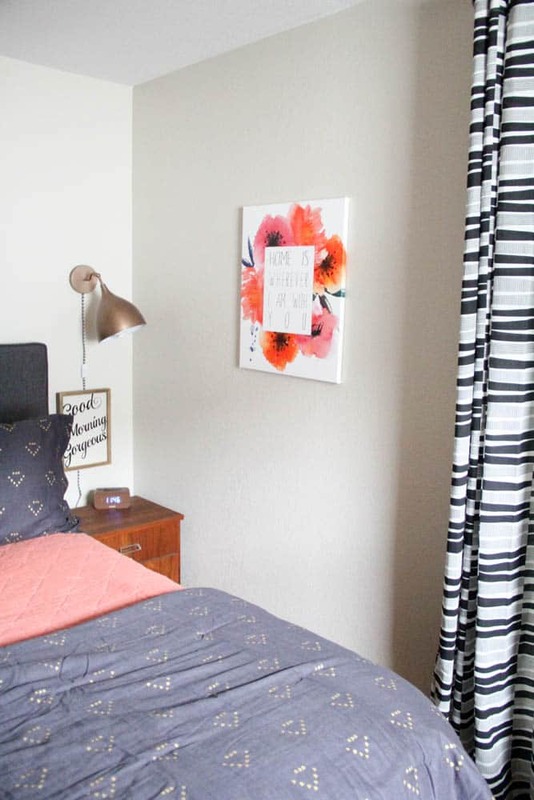 If you’re a loyal reader maybe you remember back in October when I announced that I was going to makeover my master bedroom in 6 weeks for the one room challenge. Today I’m here to tell you that I failed miserably. Shortly after deciding to participate in the challenge I found out I had skin cancer, and we decided to sell our house and move cross country! 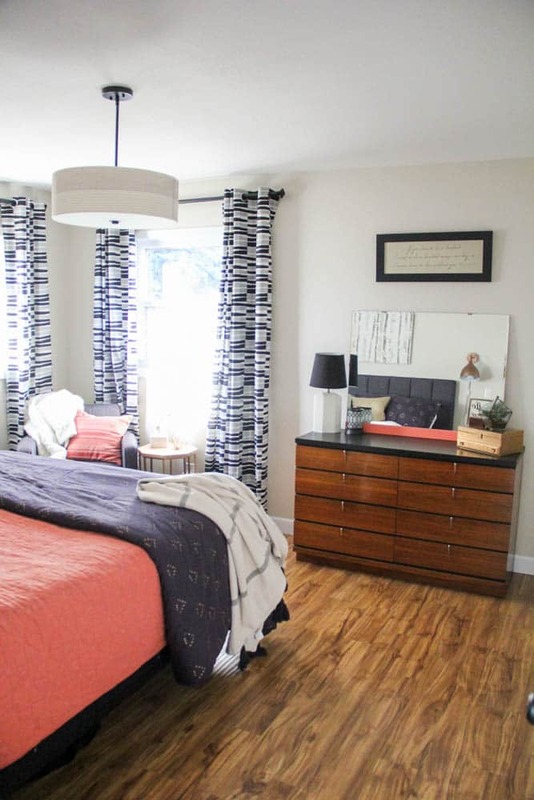 Although the bedroom got put on the back burner, I still did move forward with MOSTLY finishing it. 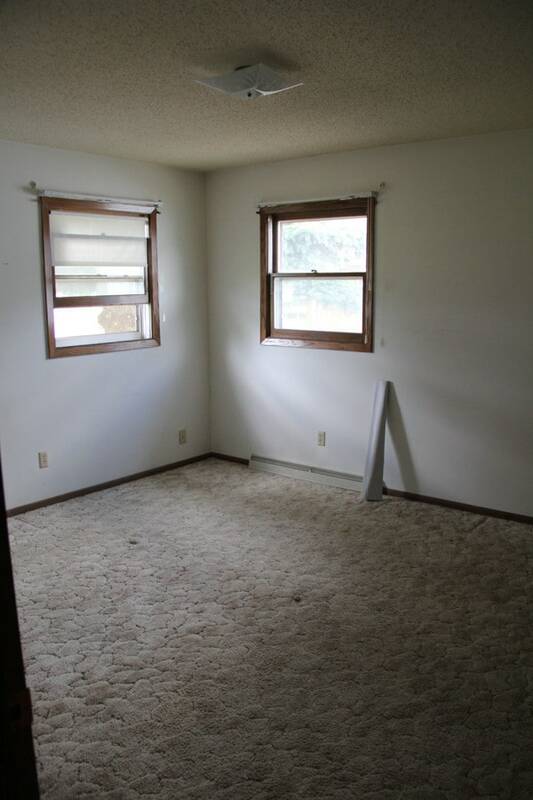 OK… here’s where we started, yes just 6 months earlier this room had wood trim, gross carpet, popcorn ceilings, and was NOT a room we wanted to live in. After a lot of hard work, paint and flooring we had a good starting point for the design process. 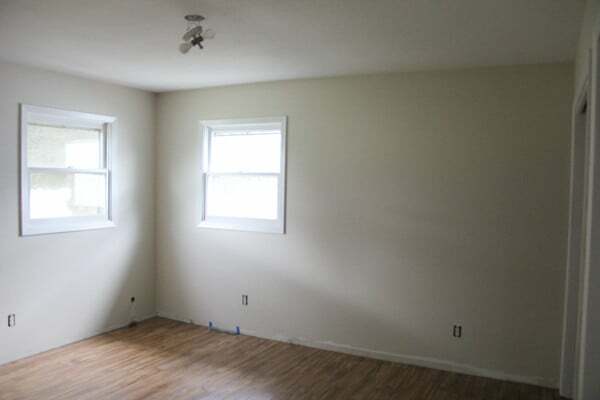 It was a completely blank slate. 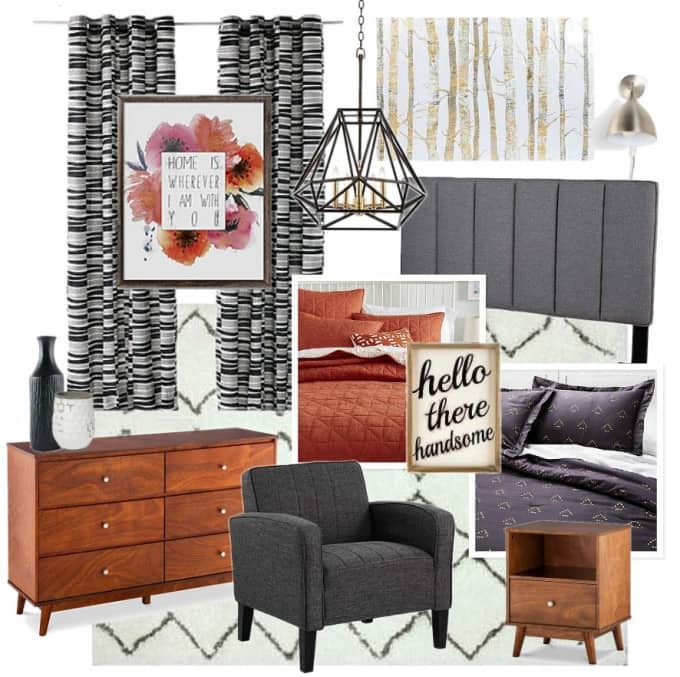 I created and shared my vintage modern master bedroom mood board and I am pretty happy with how it all came together. Probably the biggest change was that I didn’t buy the geometric light fixture. Mainly because I wasn’t willing to spend that much just to have to leave it behind. 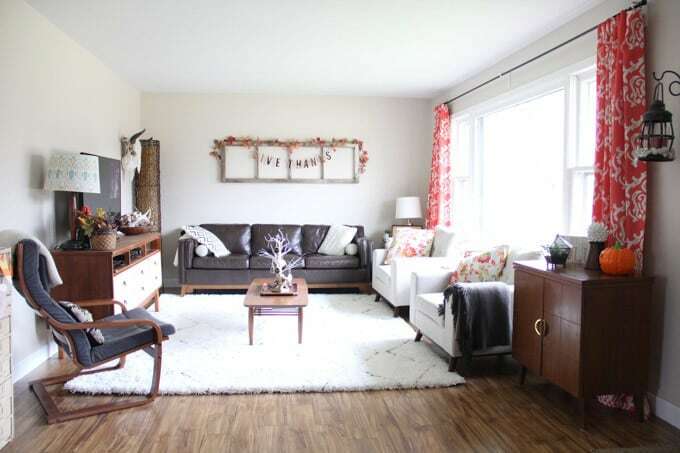 I also ordered the rug *affiliate link* that I planned on using in the bedroom, but after it arrived my mom convinced me to use it in the living room. As sad as I was to not use it in the bedroom I agreed that it looked awesome in the living room too. OK, back to the bedroom. I love how the bed and wall behind it came together. 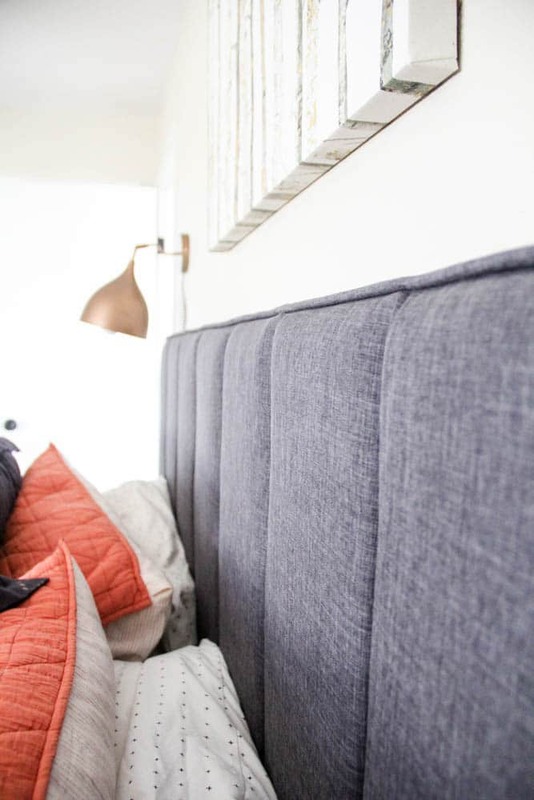 I also love how the channels in the upholstered headboard give it a masculine vintage feel. I had thrifted the nightstands a long time ago and I still think they’re awesome. The sconce lamps were probably one of my favorite parts of the entire design. They were so perfect for the room that I agreed to sell them to the new owners of the house. Now I’ll be on the hunt for another set of brass sconces! 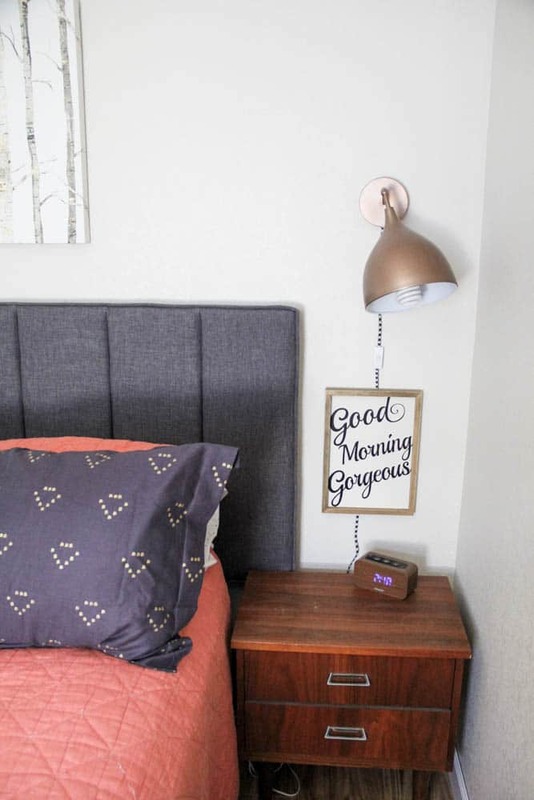 The “Good Morning Gorgeous” and “Hello Handsome” signs were from Hobby Lobby and are wood signs. Even though they’re cutesy and probably part of an already fading fad I also totally love them. The canvas above the bed was also Hobby Lobby. The trees in the print remind me of the Aspens when we lived in Colorado. 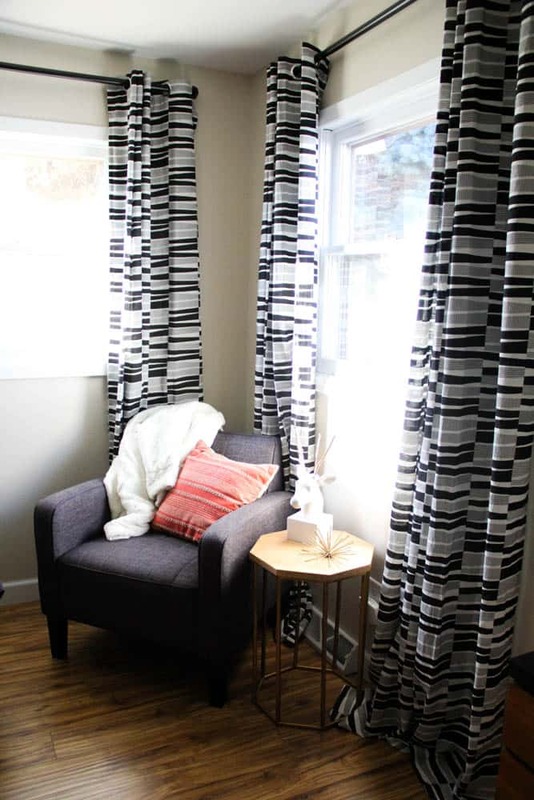 I also love how they contrast the black and white curtains. 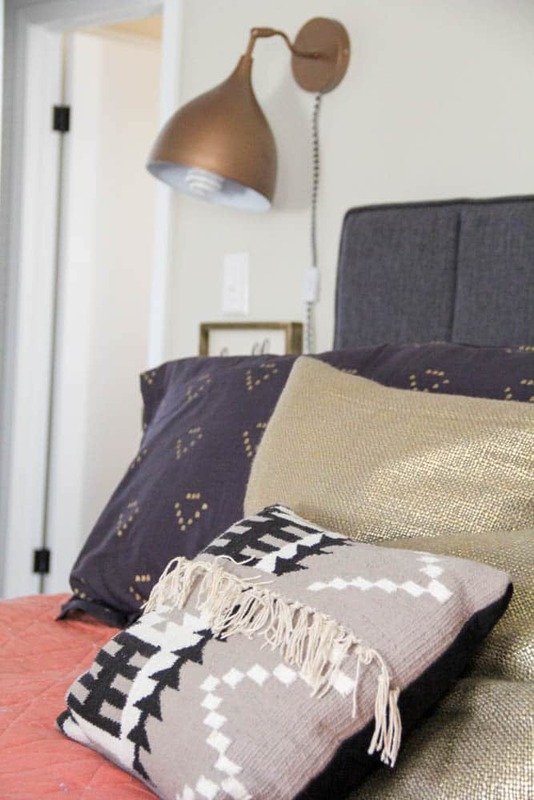 Of course I used some pops of gold… because really, what room is complete without a pop of gold? At least not a room in my house! 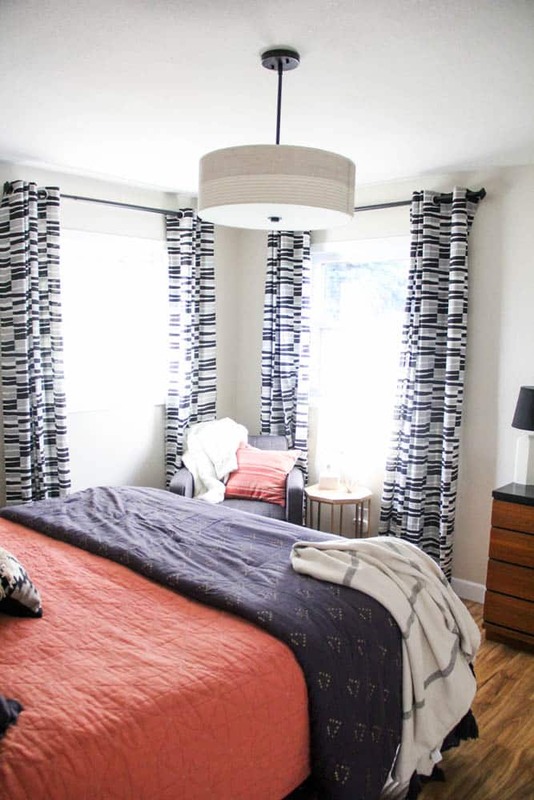 The light fixture is just a big linen drum shade but definitely made the room feel a lot more like a master bedroom, and less like just another kid room. 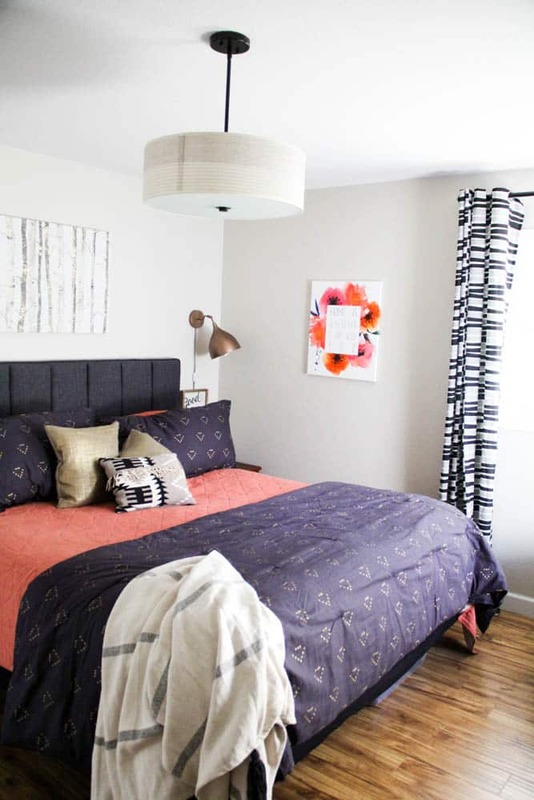 I love how the canvas pulls the coral color from the coverlet. 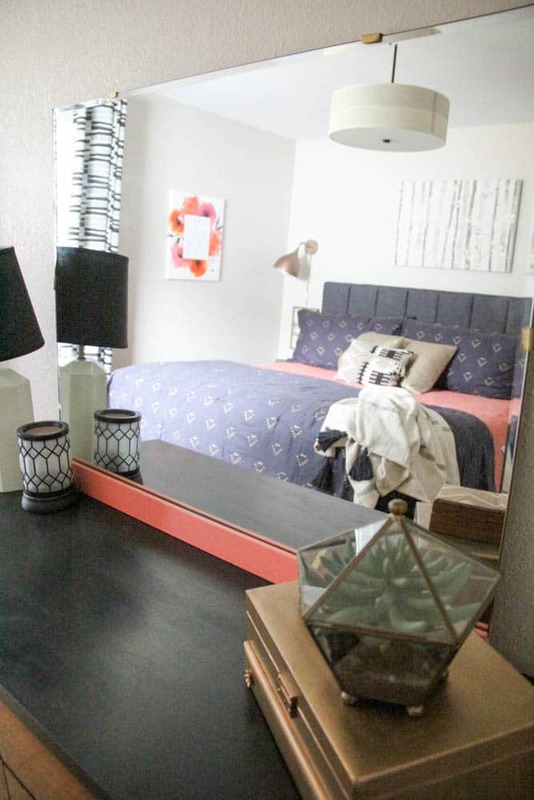 It also brings life to the room and keeps it from being a drab black and white room. 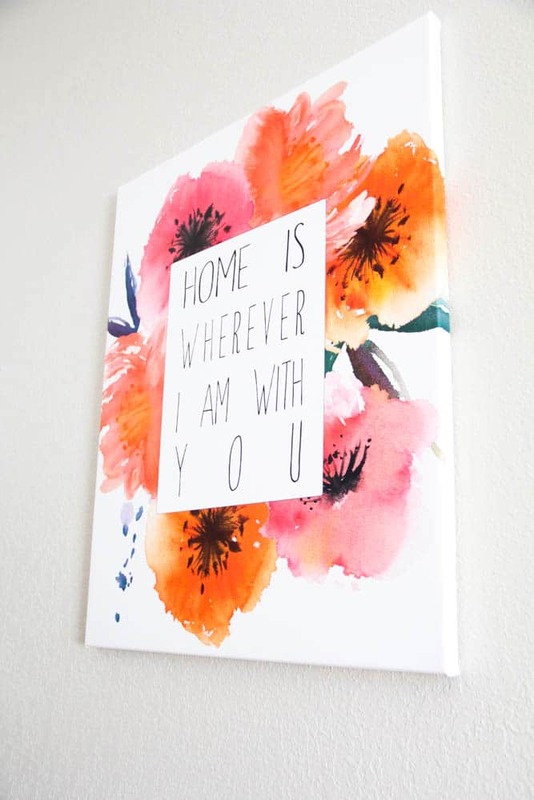 The floral canvas says, “Home is wherever I’m with you” and has been more true ever during our recent move. Even though we’re currently in a crummy rental the fact that we’re all together has made it feel like home. 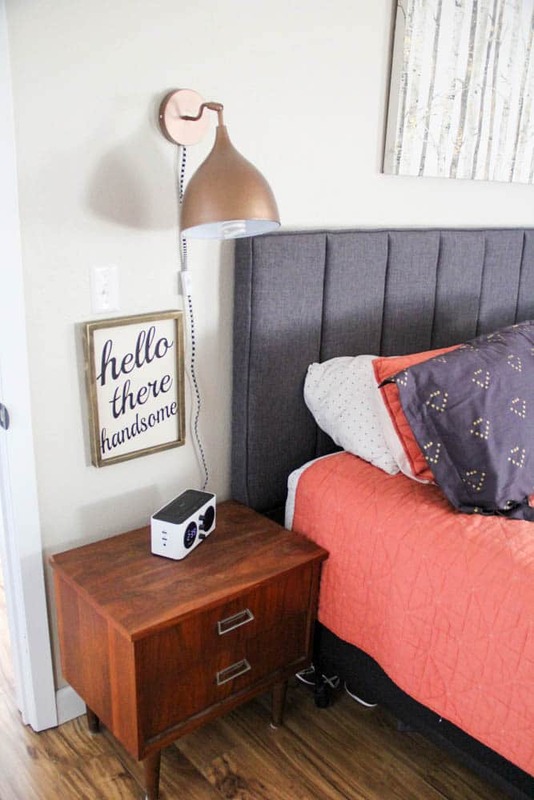 I shared how I made over the dresser and I loved the way that it worked in the space. I just set a mirror on the dresser that I painted coral a long time ago. It happened to be the perfect size and it made me thankful that it didn’t sell in our last garage sale! 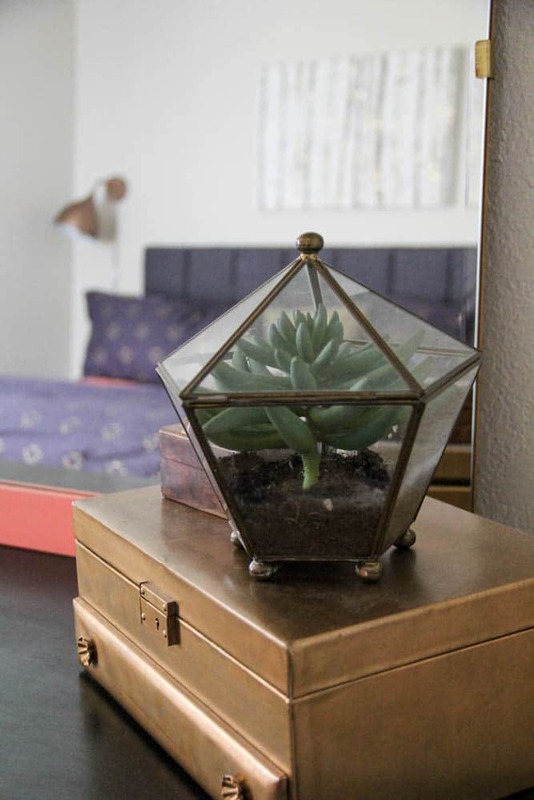 The terrarium was a vintage find and I just put a faux succulent into it. I also love this vintage jewelry box that added another pop of gold to the room. The chair in the corner got moved here from our living room. 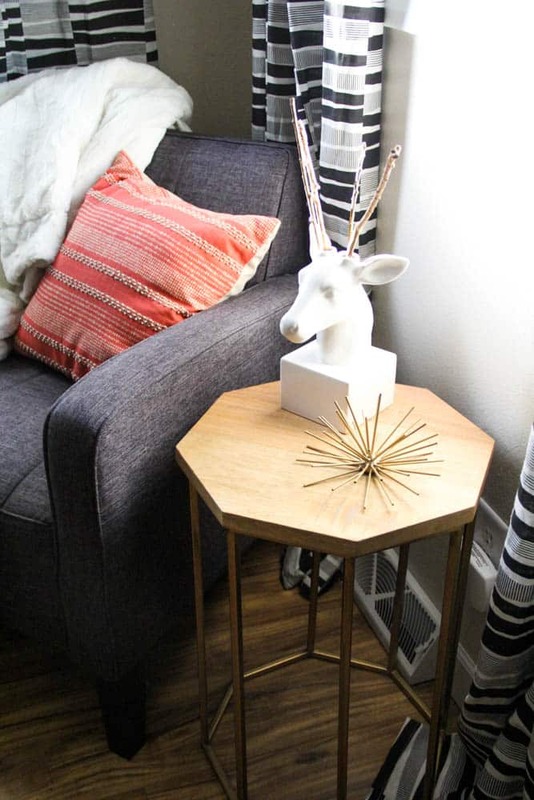 It’s the Sauder Ellis Accent chair and I have two of them and have used them in multiple spaces all over the house. Even though I didn’t get a chance to spend as much time, energy, or money on this room as I wanted, I still love the way that it came together. Many of the items in this room were ones that I’ve had for a long time, or pulled from other rooms in the house. 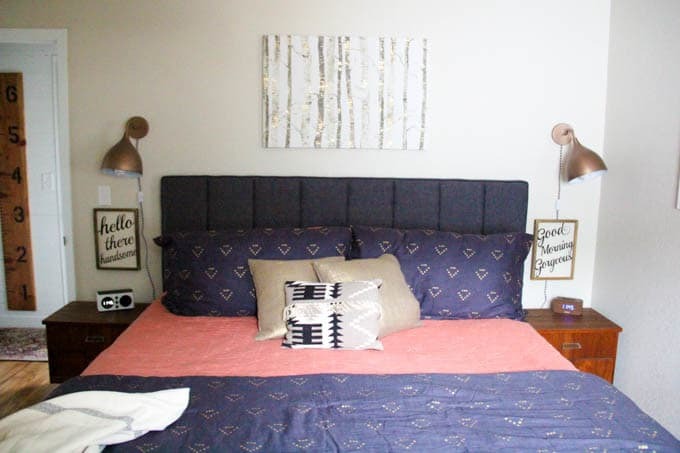 The only items that I went out and bought specifically for this makeover were the two art prints, the light fixture, and the black bedding. 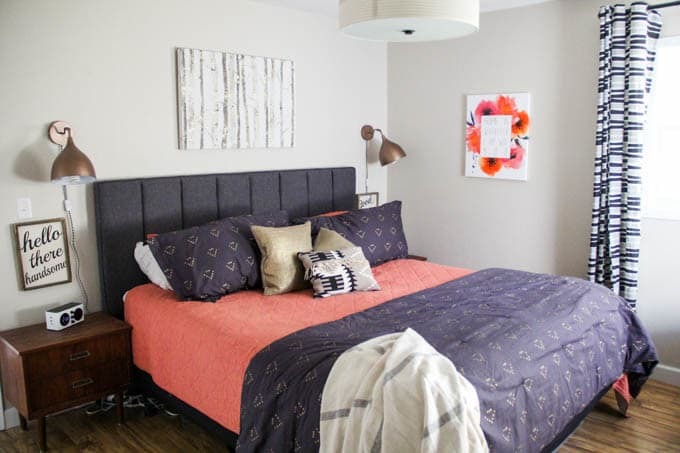 I want to encourage you that a room makeover doesn’t always mean starting from scratch, or finishing it overnight! Often it just involves keeping your eyes open when thrifting, and then shopping and rearranging other rooms of your house.